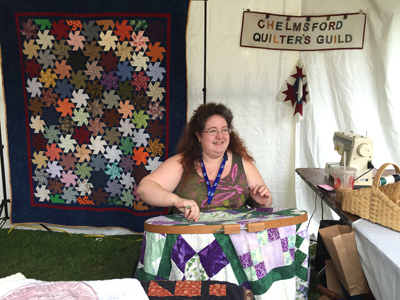 Kudos to all the textile artists who made the Folk Craft area of this year’s Lowell Folk Festival so vibrant! 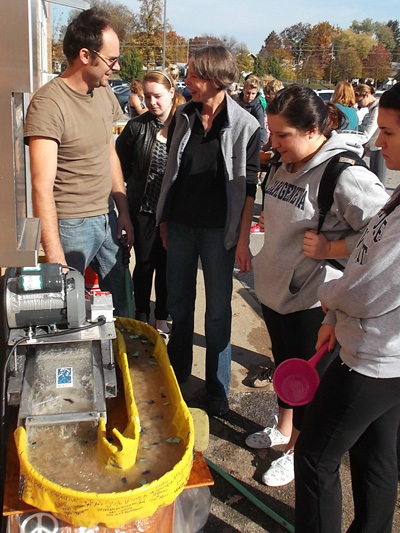 Here are some images from the two-day event. The Lowell Folk Festival is coming right up on July 24-26th. 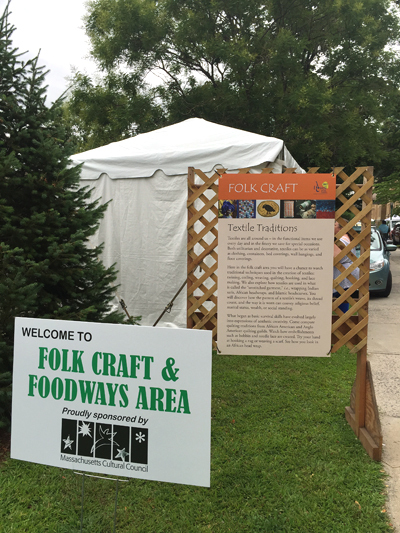 In addition to checking out music and dance performances and sampling some of the best ethnic food served at a festival, consider spending some time in the Folk Craft area located in Lucy Larcom Park. 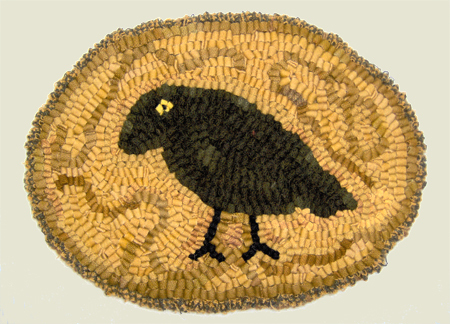 This year we are featuring 13 different textile traditions. 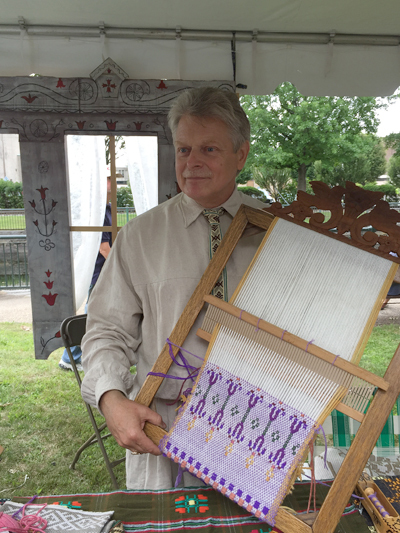 From noon until 5:00 p.m. on Saturday and Sunday, artisans will demonstrate traditional techniques used in the making of textiles: twining, coiling, weaving, quilting, hooking, and lace making. 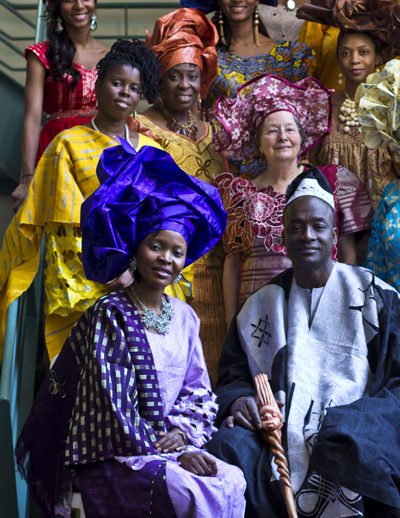 Others will explore how textiles are used in what is called the “unstitched garment,” i.e., wrapping Indian saris, African headwraps, and Islamic headscarves. You will discover how the pattern of a textile’s weave, its thread count, and the way it is worn can convey religious belief, marital status, wealth, or social standing. 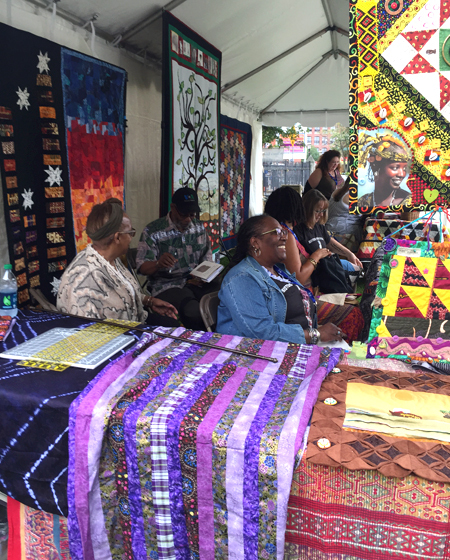 Come compare quilting traditions from African American and Anglo American quilting guilds. 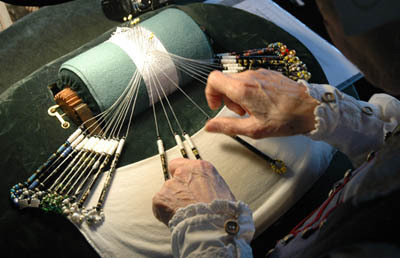 Watch how embellishments such as bobbin lace are created. See how you look in an African head wrap. 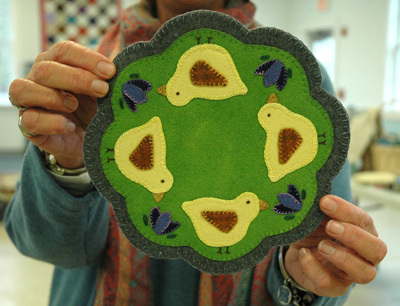 Try your hand at hooking a rug . . . 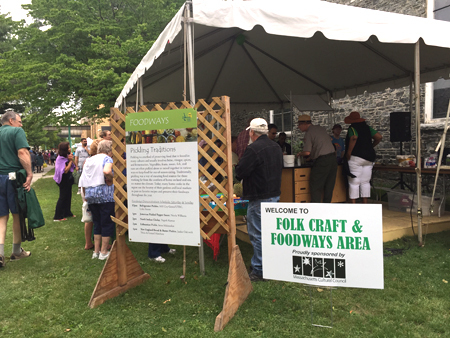 If you get hungry and tired and want to sit down, the Foodways demonstration area is close by. 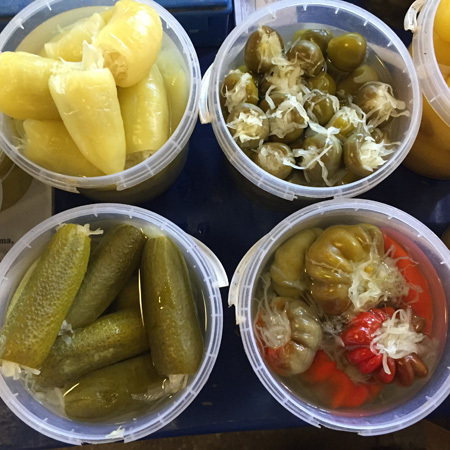 My colleague and friend Millie Rahn has put together a tasty program on pickling traditions. The schedule is below. 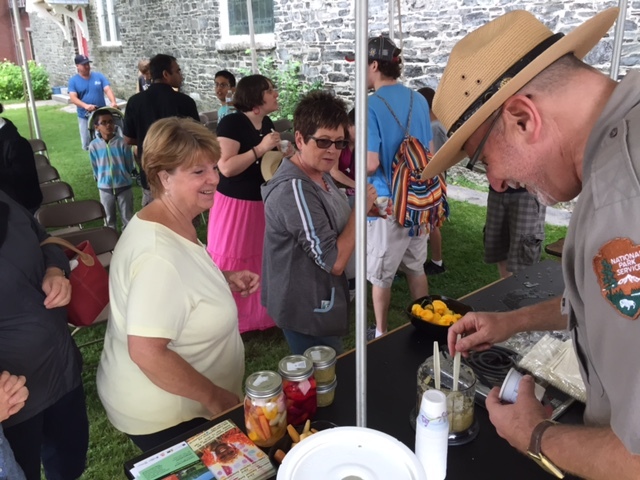 As in past years, you will have a chance to ask questions and to taste samples once each demonstration is over. 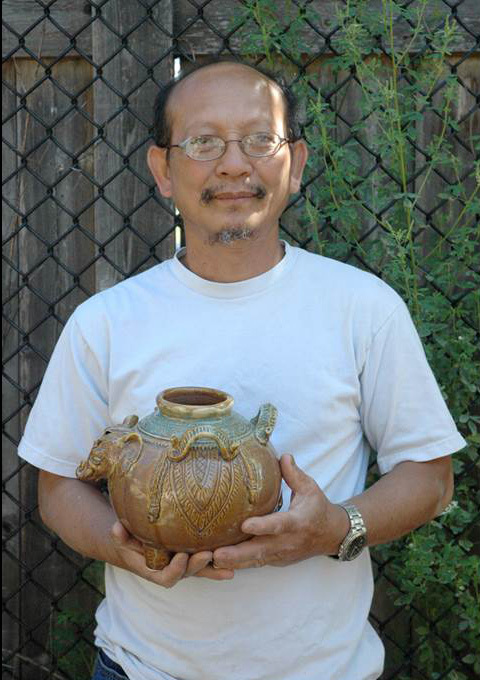 We are thrilled to announce that Yary Livan, a Cambodian ceramicist living in Lowell, Massachusetts, has just been named a National Heritage Fellow. Given by the National Endowment for the Arts, these fellowships are the nation’s highest award in the folk and traditional arts. 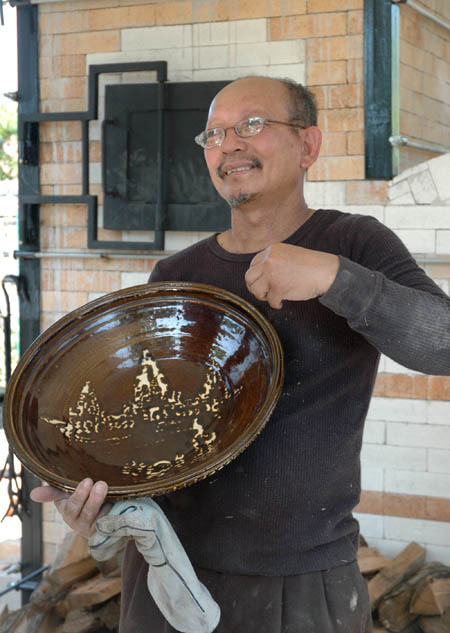 Yary Livan is one of the only known Cambodian master ceramists to survive the Khmer Genocide and still actively creating Cambodian ceramics and temple ornamentation. 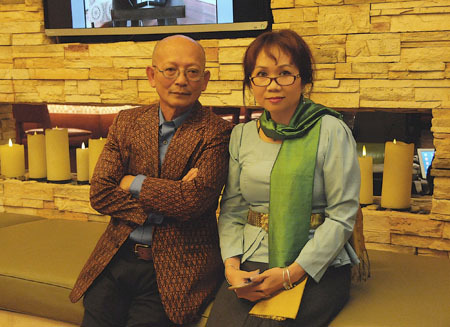 Yary’s training in the classical art of Cambodian ceramics at the Royal Academy of Fine Arts in Phnom Penh was disrupted when the Vietnam War spread to Cambodia in the early 1970s. After three years of unspeakable hardship, Yary was granted the status of political refugee; he left Cambodia on July 13, 2001, for Lowell. Yary is currently teaching school residencies in Lowell, infusing traditional arts into curricula for elementary, high school, and community college students. He continues to make artistic contributions to community celebrations like Cambodian New Year and the Southeast Asian Water Festival. 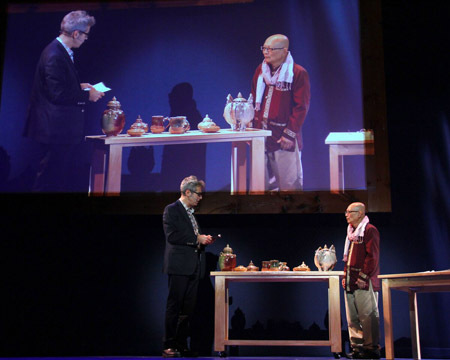 Material culture has been a life line, connecting Yary to vital resources and linking him to students to whom he is passing on the ancient and endangered tradition of Khmer decorative art. 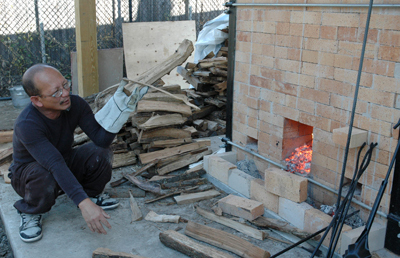 He recently fulfilled a decade-long dream of building and firing in a wood burning kiln. The hope (and beauty of it) is that the kiln, and the ware fired inside of it, will help insure the tradition of Khmer ceramics continues and thrives, along with one of its finest practitioners. 2015 has been a banner year for Yary Livan. 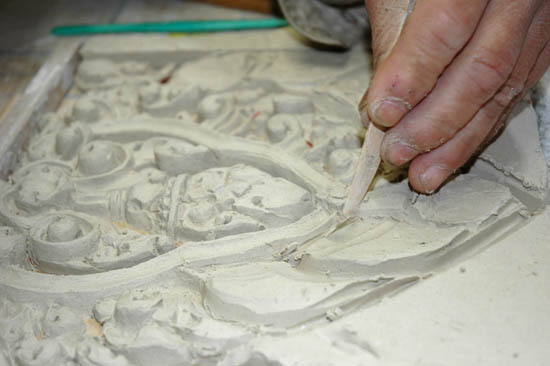 He gave his first public talk at a NCECA [National Council on Education for the Ceramic Arts] conference. He returned to his homeland for the first time since emigrating in 2001. 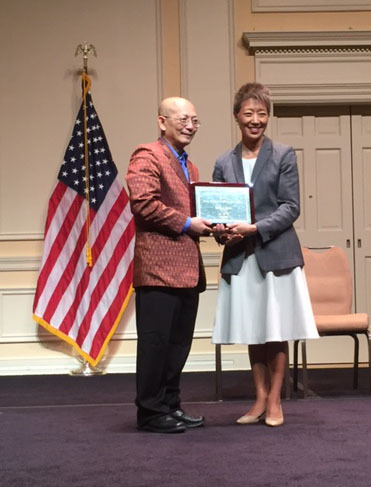 On October 1 and 2, 2015, the 2015 fellows will be feted in an awards ceremony and concert in Washington, DC, on October 1 and 2, 2015. I smile just thinking about Yary being recognized and honored as one of our nation’s national heritage fellows. 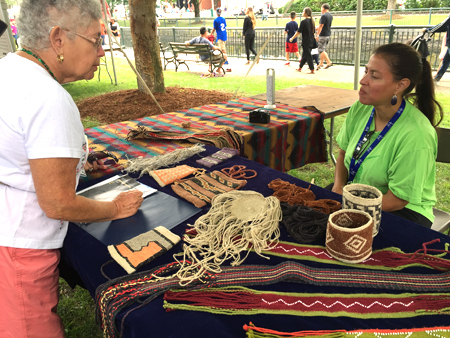 As mentioned in two recent posts, this year’s Folk Craft area of the Lowell Folk Festival will feature textile traditions. 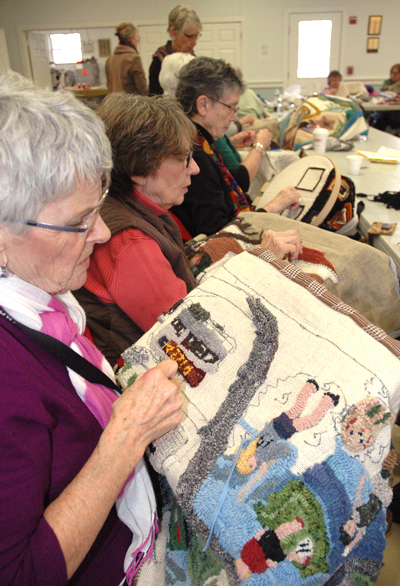 You will have the opportunity to watch artisans demonstrate techniques such as lap and loom weaving, quilting, lace making, basket making, and rug hooking. 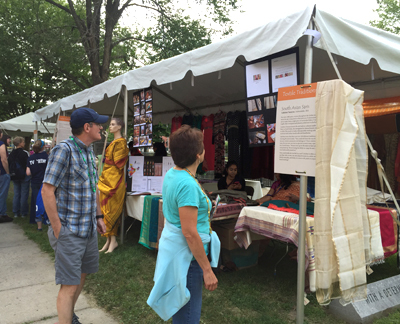 In addition, there will be a tent dedicated to the textiles and techniques used in creating what is known as the “unstitched garment,” e.g., South Asian saris, African headwraps and fashion, and Islamic hijab and abaya. For over 1,000 years, women throughout the Indian subcontinent have worn the sari. Conceived on the loom as a 3-dimensional garment, the sari is made from a single piece of unstitched fabric 5 to 12 yards in length, that is wrapped and pleated, pulled and tucked around the body. Lakshmi Narayan knows the sari both as cultural insider and researcher. 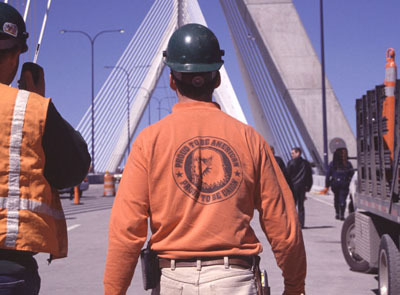 Born in South India, she immigrated to Massachusetts with her family in 2000. 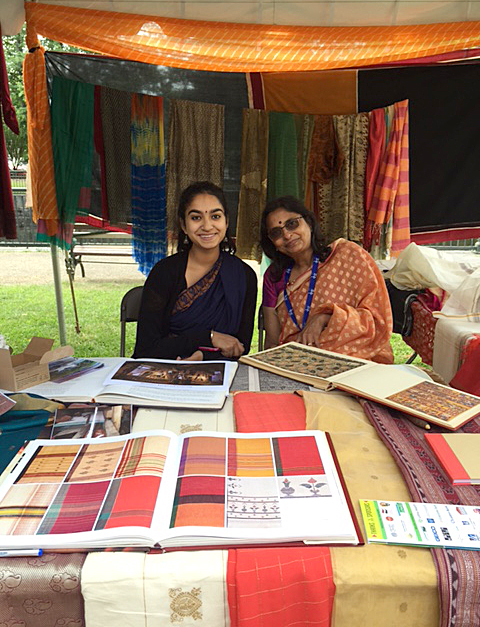 When possible, she travels to India to work with people involved with Indian handicrafts and handlooms. African headwraps can be truly sculptural in form. Their voluminous style enhances the face, like a crown worn by a queen. Roselines more fanciful headwraps are wrapped, pinned, and sewn, thereby holding their shape. A single headwrap provides multiple looks, depending on how it is positioned. 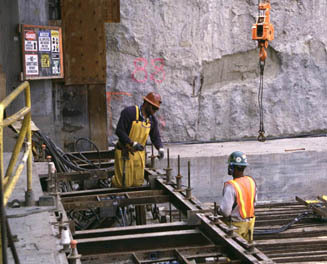 The variety is a form of improvisation, a concept fundamental to African and African American performance. 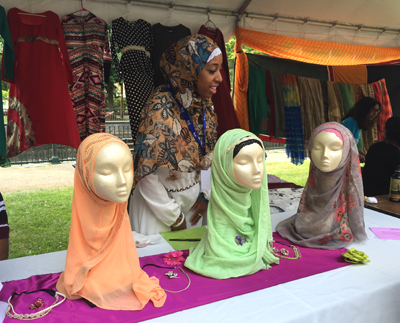 Qamaria Amatul-Wadud designs and sews clothing for Islamic women who choose to dress modestly. She is skilled in making both the hijab (headwear) and the abaya (outfit). 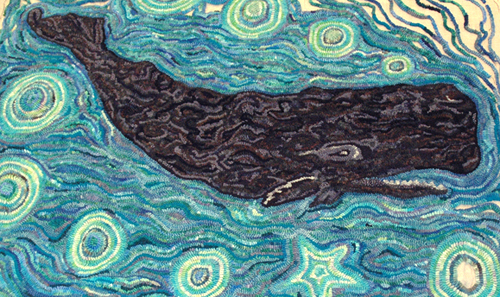 Her creations are primarily for herself, but also for friends and family. In her Muslim community there are many women who sew for themselves, because modest, fashionable clothing is often hard to find commercially. The Islamic hijab can be square or rectangular, and fastened with a safety pin under the chin and worn with a decorative hijab pin or headband on top. 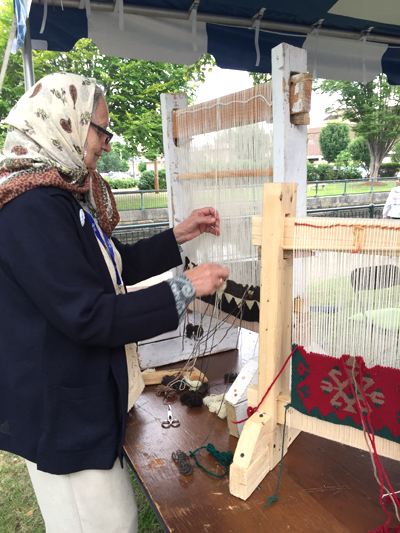 Qamaria adds her own twist to a traditional craft. She considers her style comfortable, yet elegant and modest, pointing out that her designs adhere to religious customs. Qamaria grew up the youngest girl in a family of 10 children. 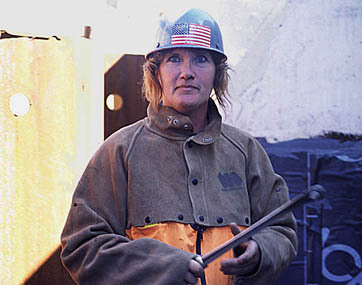 She started sewing her own clothes when she was 14, following in the footsteps of her mother and older sisters. She makes outfits for every-day, party, and wedding wear, including headscarves, tops, and pants. She never makes an outfit the same way twice, preferring to “switch it up a little.” Now she is passing on the tradition of handmade clothing by teaching her young niece to sew. 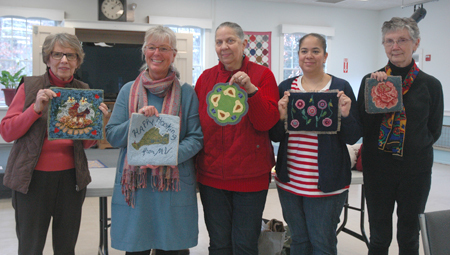 It’s that time of year when we are busy selecting craft demonstrators for the Lowell Folk Festival. Our theme is textile traditions and for the past several months I’ve been traveling to meet with people who are passionate about hand crafting textiles out of wool, cotton, and linen. 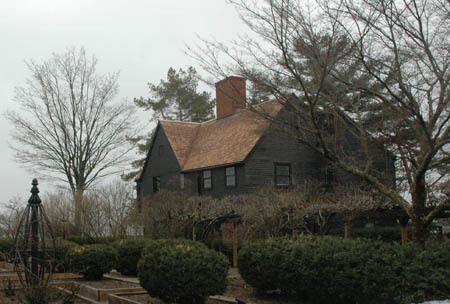 In Colonial New England, prior to the availability of manufactured goods, women were primarily responsible for the production of household textiles. Cloth was woven out of homespun cotton, wool, and flax; quilts were pieced together from worn out clothing and feed sacks. 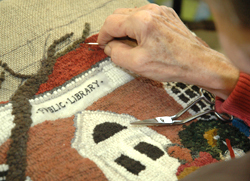 Women sewed the family’s clothing, hooked rugs, and knitted sweaters and mittens. Of course, the late 19th century Industrial Revolution changed all this. 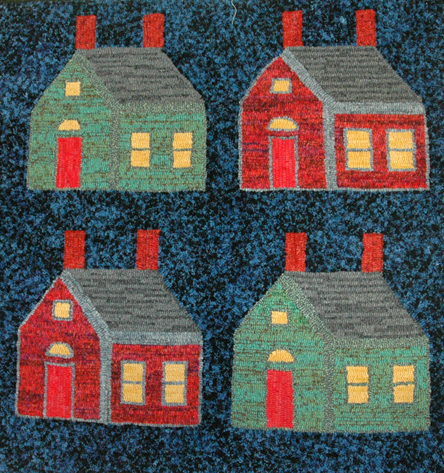 As pictured above in Sally Palmer Field’s Mile of Mills wall hanging, Lowell is the birthplace of the American textile industry. Once fabrics were manufactured locally, they became more affordable. Today, the majority of textiles we use are commercially manufactured halfway round the world. 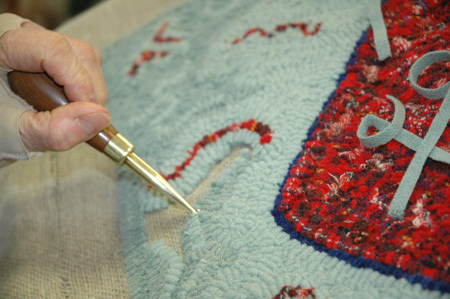 Buying hand-crafted textiles has become something of a luxury. 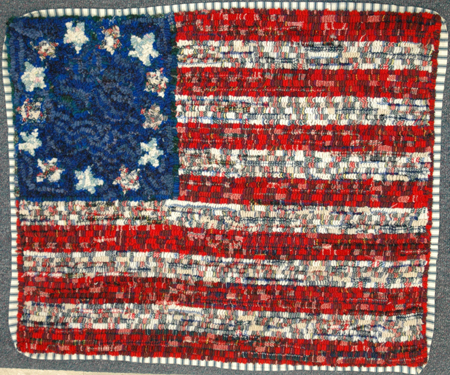 What began as basic survival skills — weaving, knitting, quilting, and rug making — has evolved largely into expressions of creative artistry. 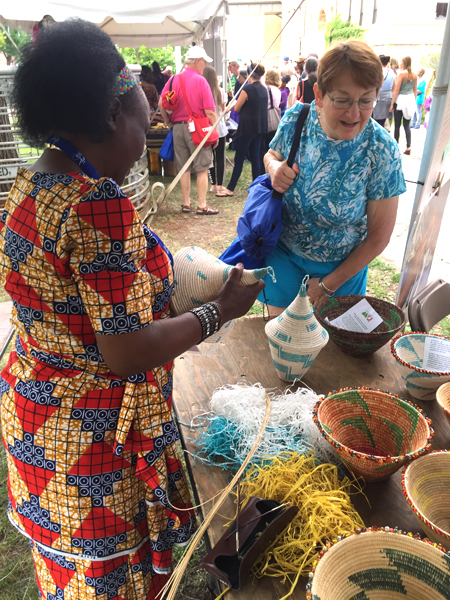 The craft artisan’s purpose/market has changed too – from domestic necessity to supplying craft fairs and galleries, and engaging tourists at living history museums. 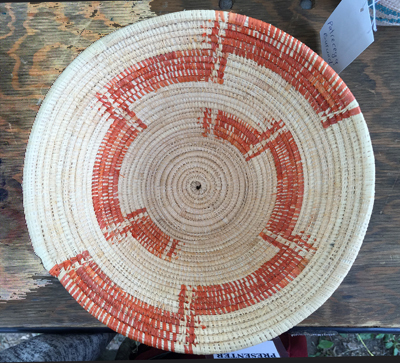 An accomplished weaver and spinner, Linda Lane learned to make lace by watching another lace maker for a number of years. Then, with the aid of a few formal lessons and some very good instructional books, she taught herself. 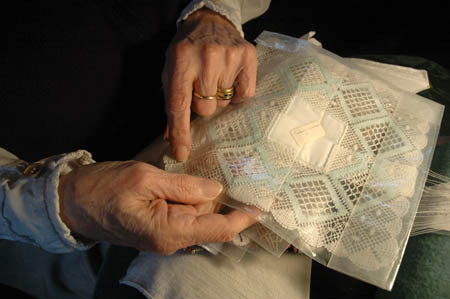 Decades later, Linda is a treasure trove of lace making history, patterns, and techniques. 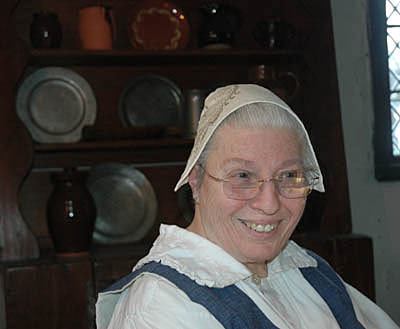 A retired nurse, Linda is currently the resident lace maker at the Hooper-Hathaway House in Salem, Massachusetts and a member of the New England Lace Group. 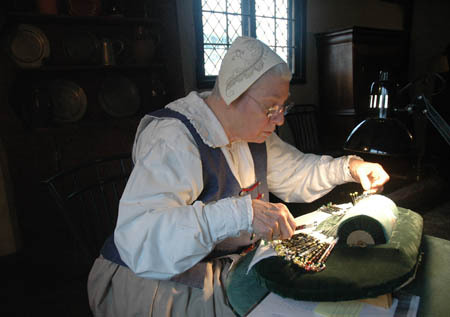 Linda weaves using 20 to 40 English bobbins, plaiting and working the lace-making fibers, which can go from 36 twos to 200 twos. 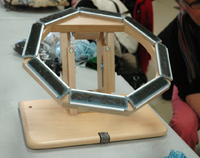 (Two is the ply – the higher the first figure, the finer the thread.) 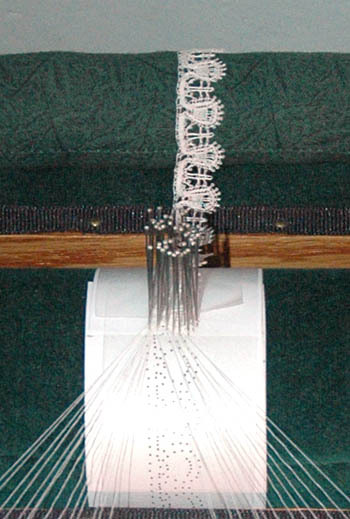 To make bobbin lace, one must have tremendous patience and keen eyesight. 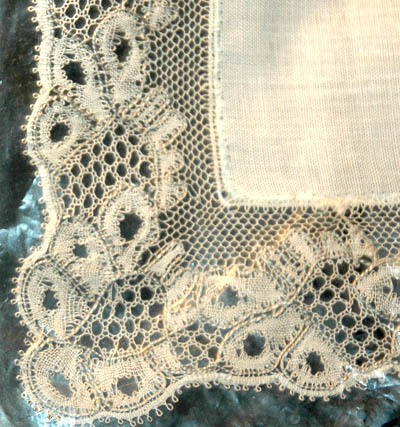 Just look at this example of lace in the making — its pattern comes from the edging found around a handkerchief once belonging to Christian the 4th, King of Denmark, circa 1644. 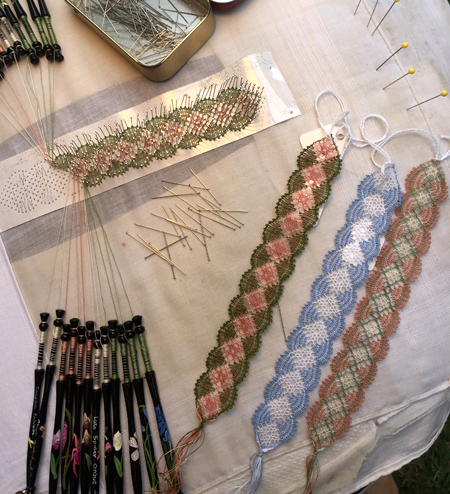 Linda Lane will be demonstrating bobbin lace making at this summer’s Lowell Folk Festival, July 25-26, 2015. 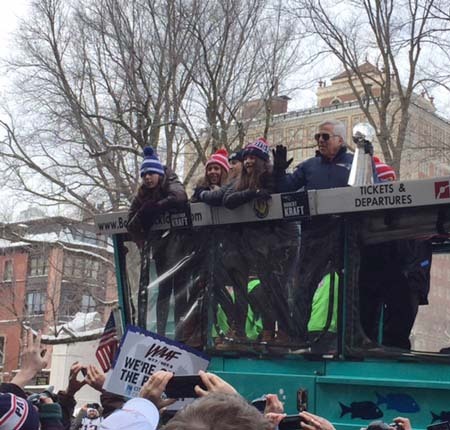 Between the New England Patriot’s victory parade down Boylston Street and the over 40 inches of snow Boston has received in just one week’s time, this image says it all. Okay, I’m not exactly a football fan and, to be honest, I have no comprehension of the game. On the big day, I didn’t watch the Superbowl — ( I’m more of a Downton Abbey fan). The only way I knew the Patriots had won was being awakened by the distant sound of fireworks going off late Sunday evening. 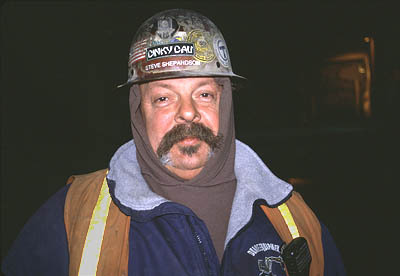 That said, I am surrounded by knowledgeable and fervent fans. 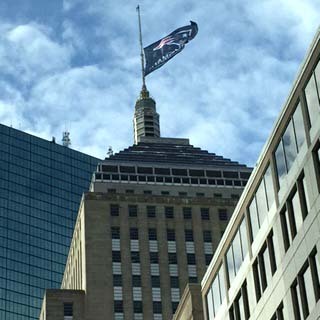 It’s hard not to get caught up in the excitement and hometown pride over the Patriot’s victory. 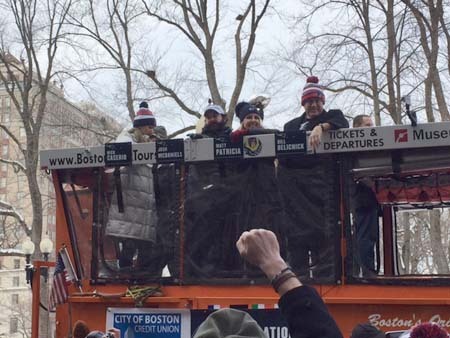 And even a sports dummy like myself knew key players ridomg by on Boston’s duck boats. 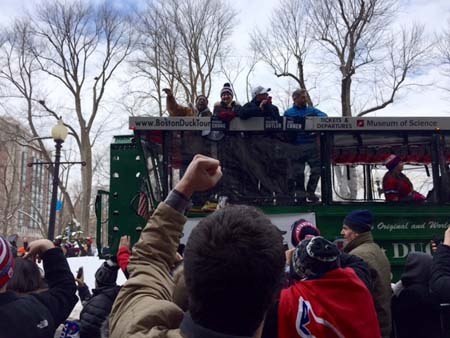 Fans cheering on Malcolm Butler. His interception is a big part of why we are all here today. 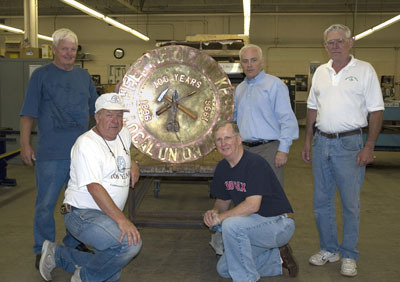 Coach Bill Belichick on the far right. Even the buildings are proud! Recycling festival T-shirts to make paper! 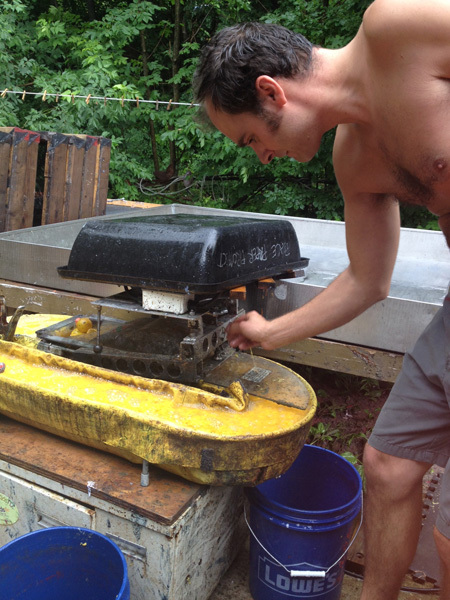 Drew Matott had an “aha” moment when he first realized paper could be made from old clothes. He and Margaret Mahan have gone on to bring the transformative experience of hand paper making to people all over the world. 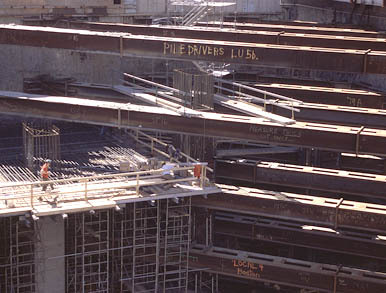 In order to pulverize rag into pulp, they use a machine designed and built by papermaking engineer Lee McDonald of Boston. 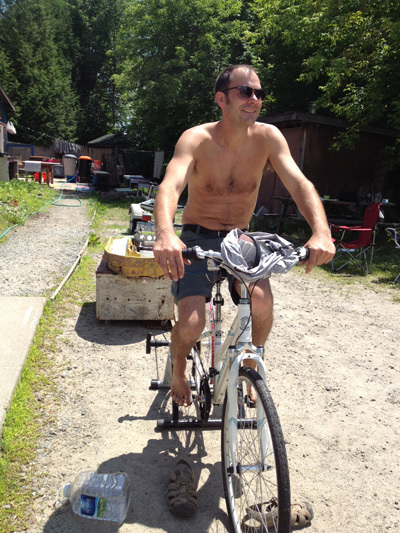 Not only is it portable, it is bicycle powered. Pulling sheets of paper is a fun and messy business. To form a piece of paper, a screen is dipped and submerged in a vat of pulp and pulled through the fibrous water. A thick wet sheet of paper forms as the water drains away. Sheets are stacked, pressed, and hung up to dry. 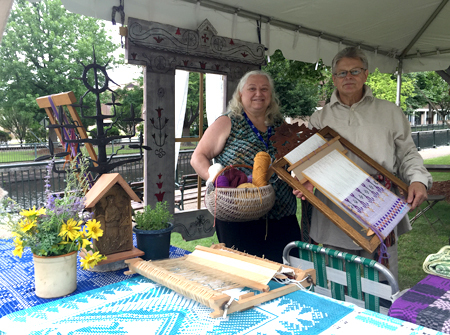 In addition to hand paper making and bookbinding, Drew and Margaret founded the Peace Paper Project in 2011. Through paper making workshops, survivors of war and terrorism have been guided to pulp the clothing they associate with their traumatic experience, including military uniforms. The clothing is cut up, beat, and formed into sheets of paper. Working with certified art therapists, participants use the paper to begin the process of adjusting and recovering from their experiences. 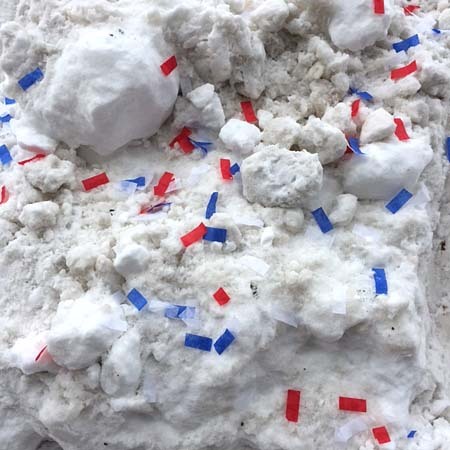 At a recent Lowell Folk Festival planning meeting, Millie Rahn and I brought up Drew and Margaret’s request for textiles that could be recycled for making paper at the festival. 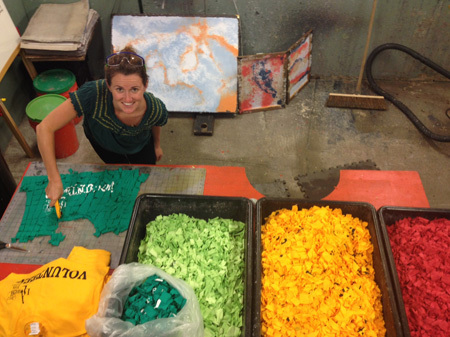 We talked about approaching a local textile mill but Pat Bowe (of The Lowell Festival Foundation) had the brilliant idea to recycle surplus festival T-shirts from festivals past. Last week, Pat mailed them bundles of brightly colored cotton T-shirts. 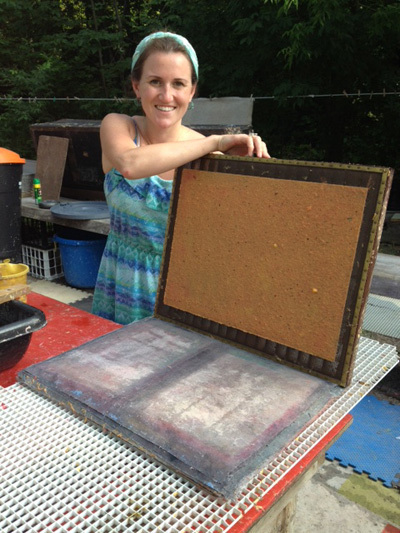 Come by to meet paper makers Drew Matott and Margaret Mahan this weekend at the Lowell Folk Festival. You’ll never look at old clothing the same way again. 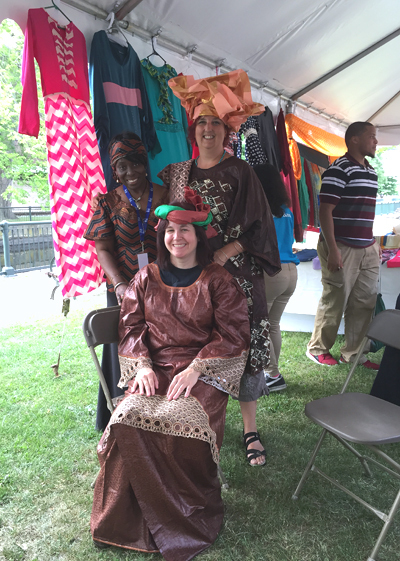 Author Heritage8Posted on July 22, 2014 March 2, 2015 Categories Annual celebrations, Craft, Public programTags Folk Craft, hand paper making, Lowell Folk Festival, making things by hand, Peace Paper Project2 Comments on Recycling festival T-shirts to make paper!